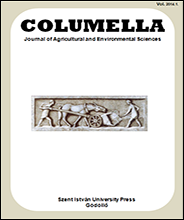 Lucius Junius Moderatus Columella (AD 4 - 70) is the most important writer on agriculture of the Roman empire. His De Re Rustica in twelve volumes has been completely preserved and forms an important source on agriculture. This book was translated to many languages and used as a basic work in agricultural education until the end of the 19th Century. Read more about Columella HERE and HERE.